Well after five months of hibernation my Dad decided to get back up on the bike again. He picked a good day to start since the weather today was awesome. With the good weather we decided to meet Rick Krepps for a two hour easy ride. 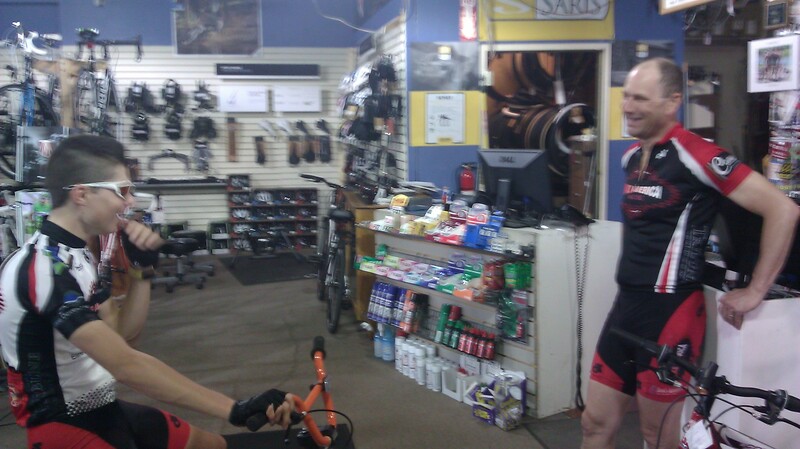 While we were riding Rick noticed some creaking noise in his bike so we agreed to head over to good old Bike America to get a tune up. While on the way over I needed to get a fifteen minute zone three interval out of the way and I thought the perfect time to do it would be when my Dad and Rick gave me a senseless attack on 3rd street. After dropping them both I solo’d in to the shop with a good gap on my field! 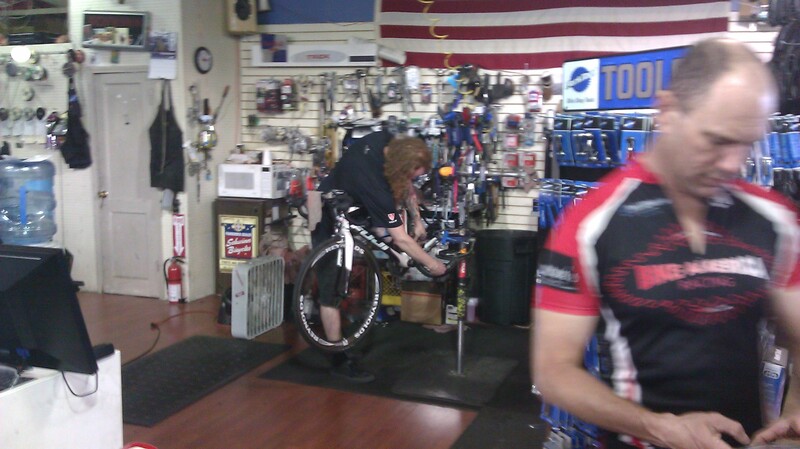 Once everyone showed up we hung out at the shop for a solid thirty minutes while Kevin “the bike wizard” fixed Ricks bike and while we were there I happened to notice a brand new 2013 Cannondale TT bike. I have to say the thing is an absolute beauty. The bike is super aero hiding all of the brake pads and components in neat little crevices to keep it out of the wind and the carbon was so shiny I could practically see my face in the reflection. So what ever Cannondale is doing they need to keep it up because that is a great looking bike. After are time at the shop we headed home to where I would continue my daily ab workout and stretch. I’ve been really wanting to take a bit more time out of the day to really get a good stretch especially since its super good for your body and the more flexible you are the aeroer (is that a word?) you can get and the more power you can dish out in those low aero positions.